U.S. Representative-Elect Ted Lieu has been elected president of the Democratic Freshman Class of the 114th Congress. 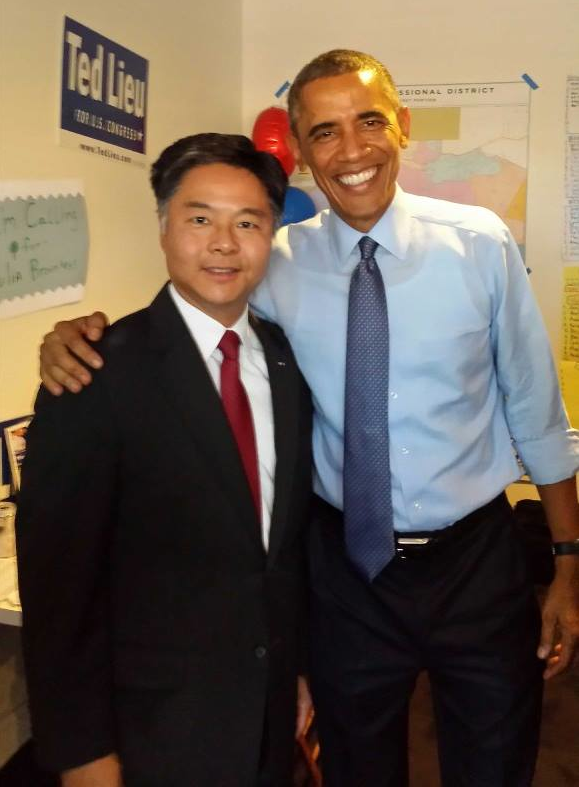 President Obama visited Ted Lieu’s Venice campaign headquarters shortly before the general election. There are 20 members of the Democratic Freshman Class, ttwo of whom were elected in 2013. Lieu will succeed the legendary Rep. Henry Waxman in California’s 33rd Congressional District. Lieu’s public service has included serving on active duty in the U.S. Air Force, and later as a member of the Torrance City Council, State Assembly and State Senate. He remains in the Air Force Reserves as a lieutenant colonel. Lieu and his wife Betty, a former California deputy attorney general, have two sons, Brennan (11) and Austin (9). The day after he defeated Republican Elan Carr in the Nov. 4 election, Lieu said in a statement: “I’m grateful and humbled to have received the strong support of the voters throughout our beautiful district. I look forward to the opportunity to serve our area in Congress. “Yesterday’s election was a difficult one for Democrats across the country, and it’s more critical than ever that members of Congress stand up for our core values, including defending a woman’s right to choose and protecting Social Security and Medicare. I’m going to Washington to take on these fights. “I’ve been particularly honored during this campaign to have the support and guidance of Congressman Henry Waxman, whose legacy is his record of extraordinary service and accomplishment for this district and our country. I also want to thank my opponent Elan Carr, who ran a spirited campaign and graciously called me last night to concede this race. The 33rd Congressional District extends from the Palos Verdes Peninsula along the Los Angeles coastline to Malibu and curves east and north to include Agoura Hills and Calabasas, Beverly Hills and the Mid-City and western Hollywood Hills portions of Los Angeles.